Hi! I'm Katie! Welcome to my little corner of the blogosphere. I am a wife, furmama, die hard Badger, water skiing - chick who loves all things pink and/or sparkly. Fashion, accessories and beauty products? Yes please! I also love wine. And coffee(until I gave it up at the beginning of the year). And wine. Fundraising and marketing professional by day, blogger and Stella & Dot Stylist by night, I am always busy and always on the go which usually equals CHAOS! Right? This blog is where all of the pieces of my life come crashing together. So sit back, relax and curl up with a glass of wine (or whatever floats your boat) and stay while, won't you? P.S. 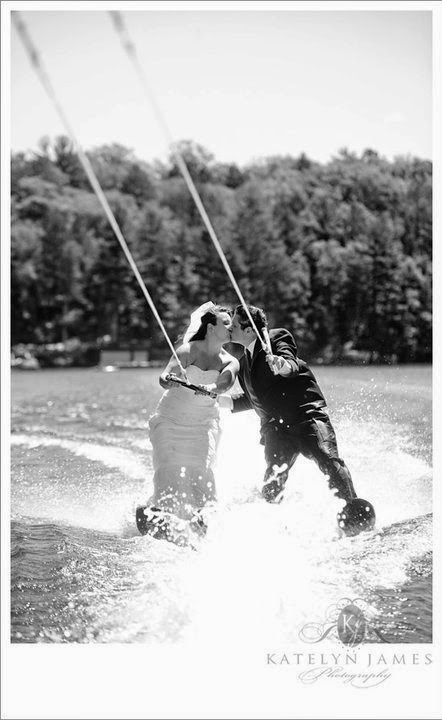 Yup, I waterskied in my wedding dress. I control 100% of the content on Cabernet and Chaos and all opinions are my own. I will always mention "c/o" in my posts, when items have been gifted to me. All photographs and materials are owned by Cabernet and Chaos unless otherwise noted. You may use my photos on the internet if you contact me first and then link back to my blog. OMG waterskiing in your wedding dress!!!! That's freaking awesome and seriously impressive!!! Excited to follow along! LOL thanks! It was a BLAST!!!!! So excited to have you here! I just checked out your blog as well and am excited to start reading it!